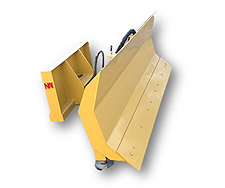 NAI's Snow Plow attachment allows the operator to clear snow quickly and easily. The curved mole board with angle ability makes clearing parking lots and driveways easy work. The Snow Plow comes with a steel cutting edge that simply bolts on and is reversible and replaceable. Trip protection is also standard on our Snow Plows.